Ask any expert and they’ll confirm it: summer time is travel season. But when your yearly holiday allowance has evaporated like a puddle on a warm July afternoon, those dreams of pampered stints in five-star resorts and romantic rendezvous in breezy beach huts remain but unfulfilled fantasies that replay in your head like a cheesy romcom. For all the seasoned staycationers out there who while away summer days on urban balconies or in countryside living rooms: bring some holiday flair into your home with some refreshing blue décor. Much like a week spent chilling on the beach, these cooler shades are perfect for recharging those proverbial batteries. Scientists speak of a calming effect and it has been proven that this hue relieves stress, promoting relaxation and inner peace. “This colour signalises purity, freshness, and serenity”, according to Professor Harald Braem from Germany’s Institute for Colour Psychology. But blue also elicits associations with water or the sky, recalling memories from your last jaunt abroad. Read on to find out how to channel soothing tones from marine to aqua to indigo for a slice of summer from the comfort of your own four walls. Goethe summed it up wonderfully: the beauty of the skies can be admired anywhere, even without embarking on epic voyages around the globe. It’s a versatile beauty, subjected to the elements of Mother Nature and the hands of Father Time. Stormy downpours meet sweltering afternoons, the beating sun gives way to a soft lunar glow, shooting stars race past twinkling ones—a fascinating interplay of constantly changing colours and forms that has enthralled philosophers, poets, and painters throughout the ages. And this rich diversity of nature hasn’t escaped our artists’ attention. The photographer Nur Mut, otherwise known as Hannes Schulze, herded sheep for a year under the Icelandic sky, capturing cloud formations and the northern lights in atmospheric stills. We can understand if Iceland’s a bit beyond your reach this summer though. 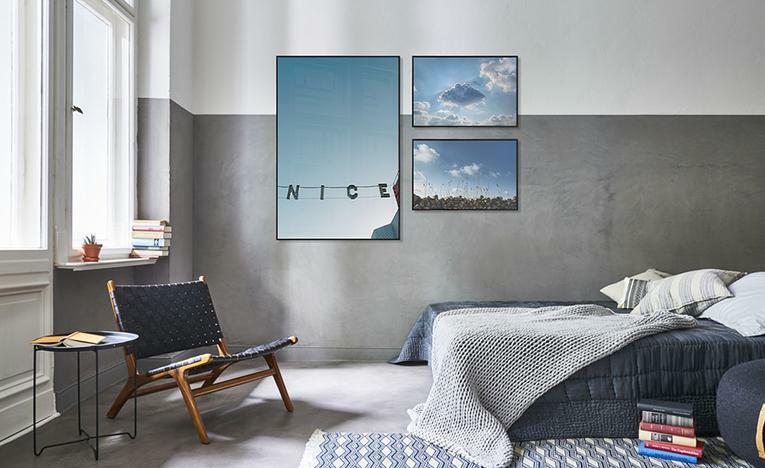 But guaranteed, azure posters will take you on a fantastical journey through powdery, pastel clouds, punctured by flocks of fluttering birds. An added bonus: in colour psychology, blue has a cooling function, making rooms temperature seem lower than they are—perfect for those sweaty summer days. Fine sand under your feet, a refreshing north-westerly breeze, the quiet cawing of seagulls, and sandcastles fit for a king: even if your next beach holiday seems like an eternity away, you can conjure the feeling of salty gusts and soothing tides with marine-blue décor. Water makes up two-thirds of our planet’s surface, with seas and oceans taking the lion’s share. If you don’t manage to jet off to the white sands of Mexico or even fit in a little excursion to the Cornish coast, you can’t go wrong with aqua-blue photography and refreshing maritime designs to get your interior in that holiday spirit. Throw an ice lolly, gripping page-turner, and a little fantasy into the mix and hey presto, it’s almost as if you were sitting right on the Italian Riviera. And, as scientific studies have shown that the sight of blue relieves cramps and even pain, you’ll have a great remedy for acute overindulgence in frozen cream delicacies on standby. It’s not just die-hard trekking fans that get their money’s worth on hikes through the Peak District. Mountains also have a lot to offer couch potatoes—from crystal-clear lakes to rapid rivers, lush forests to rocky cliffs. And after an exhausting ascent or comfortable cable-car ride to the summit, you’re closer than you’ll ever get to the heavens on your own two feet. 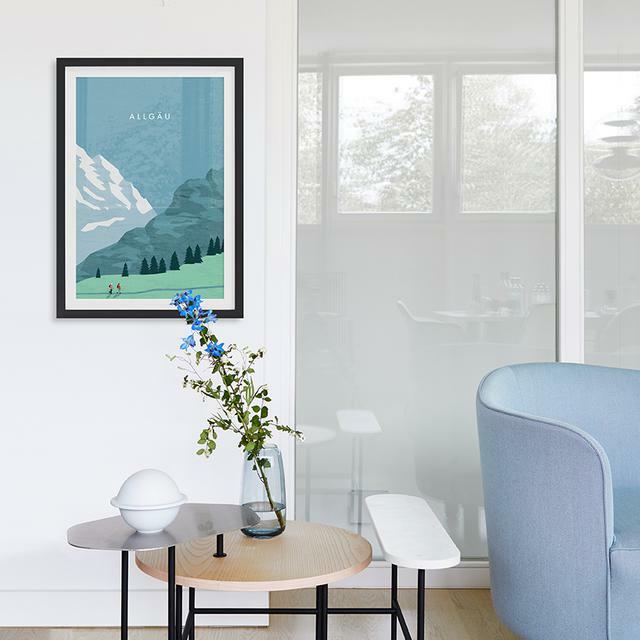 If, sadly, you have to forgo adventurous forays up the peaks of the world this year, we have a horizon of blue-tinged mountain motifs that reflect the myriad beauty of the sky, rivers, and lakes. The view of endless expanses will encourage you to lace up those imaginary hiking boots and take your thoughts for a walk through the wild. Admire the view in its unrivalled grandeur, smell the alpine flowers, and feel the tingling of the warm rays from beyond the peaks on your sun-kissed cheeks, while scoffing down some matured Swiss cheese before your descent. 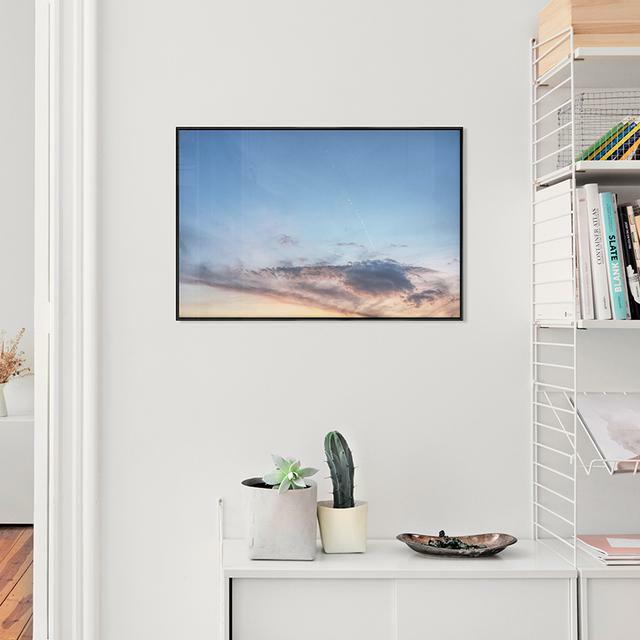 We all dream of travel destinations worlds away, but thanks to blue wall art, we come incredibly close from the familiarity of our own homes. 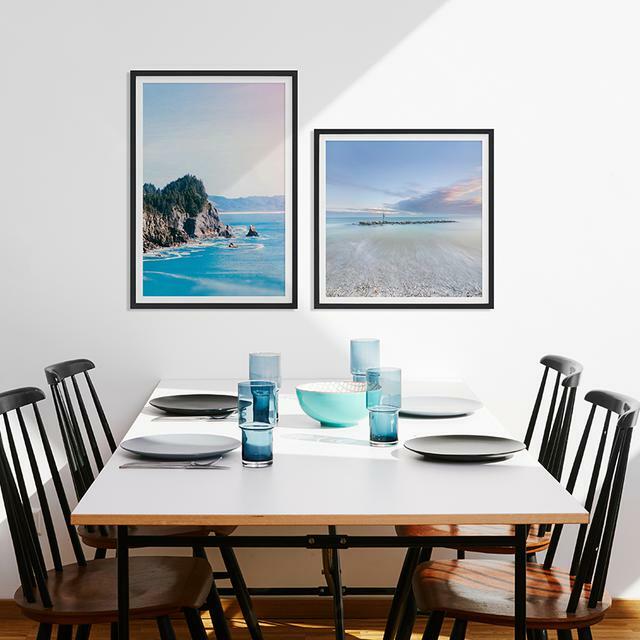 Whether you go for royal or navy, aqua or marine—with minimal effort you can bring the prettiest sunsets, calmest coastlines, and most majestic mountain ranges to your own four walls. And the best bit? While our jaunts abroad last only days or weeks, that homely holiday feeling can be enjoyed all year round.